Charlie Fineman (ADAM SANDLER) hat seine Familie bei den Terroranschlägen vom 11. September verloren und leidet bis heute an den Folgen dieses Traumas. Als er eines Tages in New York zufällig seinem ehemaligen College-Zimmergenossen Alan (DON CHEADLE) über den Weg läuft, ist dieser fest entschlossen, ihre alte Freundschaft wieder aufleben zu lassen und Charlie dabei zu helfen, mit seinem großen Verlust fertig zu werden. Neben Adam Sandler (“Klick”) und Don Cheadle (“L.A. Crash”) spielen Jada Pinkett Smith (“Matrix”) und Liv Tyler (“Herr der Ringe”) unter der Regie von Mike Binder (“An Deiner Schulter”), der auch das Drehbuch schrieb, in diesem bewegenden Drama über Freundschaft, Liebe und Verlust. Neben Graham Nash, The Pretenders, Marc Cohn, Jackson Browne, The Who und Pearl Jam steuerte auch Bruce Springsteen zwei Songs aus dem “River” Album bei. Zu hören sind “Out in the Street” und “Drive all Night”. Der Film läuft am 23. August 2007 in Deutschland an. Derzeit entsteht ein Dokumentarfilm über das Lebenswerk des Musikers Joe Grushecky. Der Streifen mit dem Titel “A Good Life: The Joe Grushecky Story” befindet sich derzeit in der Produktion und wird im Sommer als Bestandteil der “Joe Grushecky Essential CD” veröffentlicht. Mit dabei ist natürlich auch Joe Grusheckys Freund Bruce Springsteen. Am 12. März 2007 wurde Patti Smith offiziell in die “Rock’n’Roll Hall of Fame” in Cleveland, Ohio aufgenommen. Die am 30. Dezember 1946 in Chicago geborene Rockmusikerin bedankte sich in ihrer Rede ausdrücklich bei Bruce Springsteen und dessen Song “Because the Night”. Bruce Springsteen beim nächsten Super Bowl? 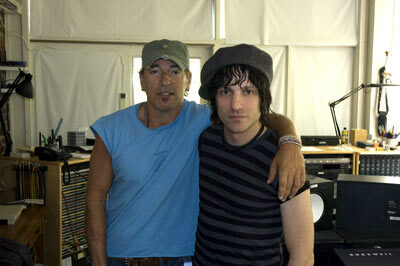 NYC’s finest returns with guest appearances from Bruce Springsteen, Josh Homme, Ryan Adams and Jakob Dylan! 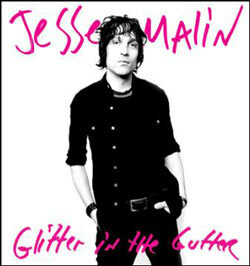 Glitter in the Gutter is the new album from NYC’s Jesse Malin, an artist who has transcended tags like “singer/songwriter” for something different and largely indefinable. 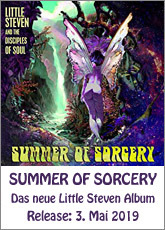 (music critic Nigel Williamson), after releasing two critically acclaimed albums The Fine Art of Self Destruction and The Heat, Jesse has established himself as a career musician who writes songs that connect on so many levels that above all, he’s a healer. The songs on Glitter in the Gutter have kept the intimate slice of life and detail of his previous records but also work on a larger palate. Jesse writes locally but thinks globally and makes his songs identifiable so that they can connect with people in every part of the world. Whether it was that type of personal impermanence or the uncertainty of our country’s future, Glitter in the Gutter is a wide musical spectrum. This album is an up-tempo, raw modern pop record that feels like a celebration of life as well as a rally to arms from the minute it begins with the anthemic opener “Don’t Let The Take You Down”. Glitter contains some work from guests of fellow musicians that Jesse has met on the road over the last 3 years, such as Queens of the Stone Age’s Josh Homme, who plays his signature guitar riffs on “Tomorrow Tonight” and Chris Shifflet of the Foo Fighters, whose iron fisted rhythms appear on “Prisoners of Paradise”. Jakob Dylan adds sweet sad harmonies on “Black Haired Girl” and there is a piano fueled duet with Bruce Springsteen titled “Broken Radio” that includes the sonic jubilee of Ryan Adams on electric guitar. There are also some other very special moments with Ryan (producer of Malin’s debut The Fine Art of Self Destruction, old pal and sometimes partner in crime) like his Latina guitar and back-ups vocals on the album closer “Aftermath”, and his blistering rock on “Modern World” and “Little Star”. Jesse remarks, “to me it’s all about songs, whether written by Elton John or Wilco or The Bad Brains”. Of the live experience, he believes “it is equally, if not more important to the connection, especially in these days of enhanced home entertainment computerized myspace.com addictions. How else can you get people out of their houses today?” he quips. When he performs, it’s about interaction through participation. He gives his fans something to celebrate. When he sits down on the floor among the crowd in mid-song, everyone follows. Ferner steuerte Jesse Malin “Hungry Heart” auf dem “Light of Day: A Tribute to Bruce Springsteen” Album bei. Die CD kann schon jetzt bei Amazon.de vorbestellt werden. Mehr Infos hier.